If you could have any practical superpower, what would it be? For many people, they’d say the ability to predict the future or make money easily (and no, this isn’t a make money quick scam). Well, you can add another item to your “Crazy things AI has Accomplished List” because Artifical Intelligence can literally do both. Artificial intelligence, after mimicking the way our brain works, is actually capable of predicting the fluctuation in future stock prices. And it’s not crazy hard to do either! The model I built’s prediction in comparison to actual prices. So, to understand Deep learning, and go deep into the type of model that the stock predictor is (Recurrent Neural Network), it only makes sense to remind ourselves how our own brains work. If you happen to be a brainiac and want to skip this refresher, you can click here to jump into the types of RNNs. For the lot who need to jog their memory on 6th-grade health class, let me Miss Frizzle it up for you, and take you on a trip into our brain. 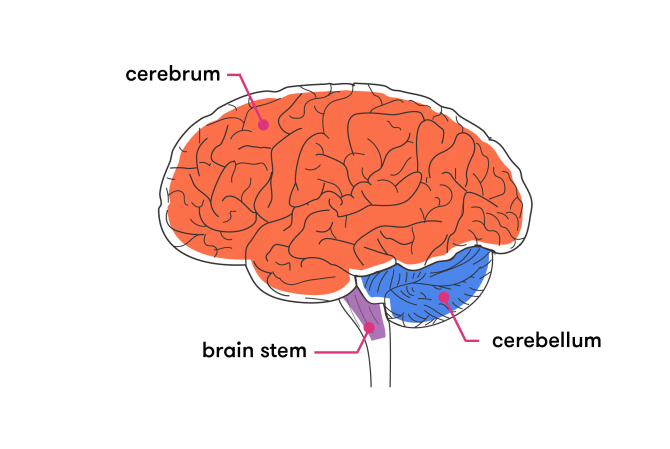 The brain has 3 main parts, the up into 3: Cerebrum, Cerebellum, and Brainstem. Deep learning focuses on the Cerebrum. The cerebrum is broken up into Temporal, Frontal, Occipital and Parietal lobes, which have been imitated through different types of artificial neural nets. Why make our most powerful tech without a short term memory? For many cases, it doesn’t make sense not to give these powerful programs this luxury. Take the example of reading this article. It’d be pretty sad if you literally couldn’t remember the previous sentence you read. 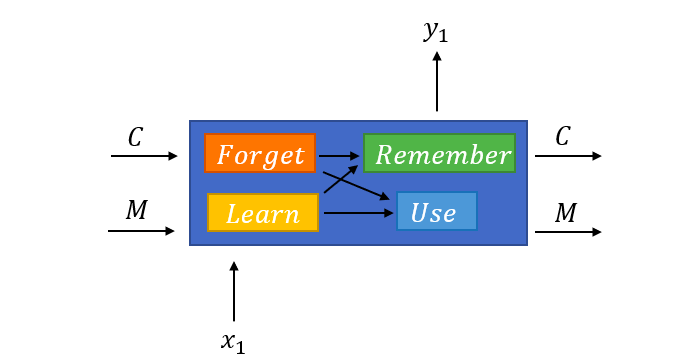 Recurrent neural nets have the ability by using neurons with short term memory. Basically, they can remember what was in the previous neurons and pass it within the network for future neurons. With the one input of, say a picture, the network produces a cohesive sentence with multiple words as an output. The RNN is able to create a sentence that makes sense because it can base the next words in the sentence on previous words. Something like a sentiment analyzer is an example of a many to one RNN. With an input of multiple words/values strung together and the understanding of what the words mean, the network classifies or gives a single output. Think about a translator, with multiple inputs (some text), that leads to multiple outputs (another set of text). You need short-term information about the previous words to translate the next word. This sounds good, a little too good if you ask me. Of course, there has to be a catch. The vanishing gradient is when the gradient ends up being very low, which causes inaccurate results and really long training time. The gradient is the rate at which cost changes with respect to weights or biases. In most cases, the gradient at any point is the product of previous gradients till that point. Cost (the difference between nets predicted output and actual output from labelled training data) is lowered by adjusting weights and biases over and over through training until the lowest value is obtained. In the RNN, the recurring weights that connect the hidden layers end up in a temporal loop — these small weights are being multiplied again and again causing the small values to become even smaller. The further you go through the network, the lower the gradient is and the harder it is to train the weights, which has a domino effect on all of the further weights throughout the network. Basically, these early layers are responsible to be the simple building blocks. If early layers get it wrong, later layers built from their outputs will be wrong as well. With the problem of the vanishing gradient, the recurring weights are less than one, so they basically vanish. The goal of the long short term memory is to make the weights equal to one and filter the inputs in terms of what the RNN actually needs to know for the next output. The LSTM cell has 4 gates to manage previous and the new input(s) to determine outputs. The choice to forget, learn, remember or use certain inputs is decided to see if they need to impact the output value or not. The LSTM identifies this and passes the relevant info on, allowing the network to evolve itself and deciding how to use its resources to best complete the task. 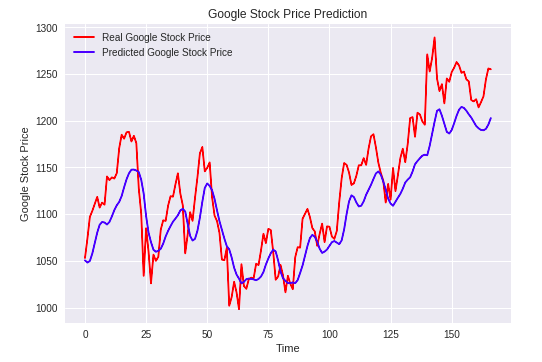 To test this out, I decided to replicate an RNN using LSTMs to predict the upwards and downwards trend of the Google stock price. This model was trained using data from 2009–2017 and then predicted the trends of 2018 (and was then compared to the actual trends). You can see all my code on my GitHub page here. We start with importing the libraries: Numpy allows us to make arrays, Matplot lib to visualize results using charts, and Pandas to import and manage the dataset easily. Then we import the training set. It’s important to notice we are only importing the training set right now(not the test set) because the RNN never actually uses the test set apart from comparing its final prediction. Next, we have feature scaling. This can be done through standardization or normalization. In this case, we use normalization to scale the values to be between 0 and 1. We create a data structure with 60 timesteps for each output. At each time (t), the network will look at 60 previous time steps to make a new prediction. The number 60 is an experiment based value — with only 1 timestep, it leads to overfitting and even 20 timesteps is still too low. The 60 timesteps would be the financial days of 3 months. We also have to reshape the arrays to add dimension — instead of only one indicator, the new dimension will allow for more indicators and be compatible with the input shape of the RNN.